To bring the offshore catamaran into the space age, modern materials and designs must be used. 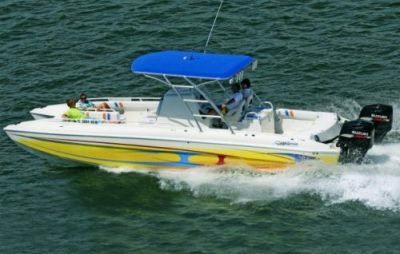 Recent years have produced a revolution in the fiberglass boating industry. There is no longer a need to produce huge, heavy offshore boats equipped with giant, fuel guzzling engines, in order to have a fast boat. Strength can be engineered by using the proper materials for the job rather than adding more material like most production boat builders. For three decades, Ross Edward Focht of Ocean Express Powerboats has been on the leading edge of catamaran design technology. His development of high quality, high technology composite catamarans has set standards throughout the world. His innovative ideas drive the Ocean Express Team to produce a boat that is fast, strong, and efficient. Ocean Express Powerboats continues to refine their manufacturing procedures to produce a superior product. And the innovation begins on the surface. O/E uses Neo-Pental Glycol based gel coats that are the best for gloss retention and long life in a marine environment.